Longstanding nonogram puzzle fans will know that Picross games have been a part of Nintendo gaming for the best part of fifteen years. The excellent Mario's Picross appeared for the Game Boy way back in 1995, but this quintessentially Japanese pastime – where a matrix of squares is carefully shaded in to reveal simple, blocky pictures – failed to take off outside its native country. This meant that subsequent Picross games, including Mario's Super Picross and the adorable O-Chan's Oekaki Logic, both for the SNES, remained Japanese-only. But with the appearance of Picross DS in 2007 this unique style of puzzle game finally found its niche in the West; where traditional joypad controls often felt slow and cumbersome in previous incarnations, Picross found the perfect home on the DS, and filling in the grids of squares felt both intimate and natural with the handheld's stylus. Three years on, and Nintendo has taken the Picross concept from its flat, paper-based origins and dragged it into the third dimension, and for the most part it's a highly successful translation. For veterans of earlier Picross games, the concept will be instantly familiar: remove the extraneous squares to uncover the hidden objects, which include animals, letters of the alphabet, plants and an entire garage full of household objects and bric-a-brac. Numbers marked on the cubes provide valuable clues as to which blocks should be eliminated and which left behind, and the act of slowly whittling a shapeless mass into, say, a giraffe is as absorbing and compulsive as it ever was in two dimensions – initially, at least. For the first hour or so, it genuinely feels as though Nintendo has pulled off the feat of making a potentially fiddly control system work; the stack of cubes is rotated with light sweeps of the stylus, while holding either Left or Up on the directional pad while tapping a cube will destroy it or colour it in. It's only when the puzzles become more difficult – and the stacks of cubes increase in size – that the cracks in the control system begin to show. Precious seconds are often spent trying to get the camera in the right position, or fiddling around with a pair of coloured handles designed to expose the stack's hidden layers, with occasionally disorienting results. It's also disappointing that every puzzle in a given level has to be completed before you can try a puzzle on the next – so if you've completed all bar one of the conundrums in normal or hard mode, for example, you won't be allowed to tackle a puzzle in easy mode. If you were feeling particularly uncharitable, you could also pick fault with Picross 3D's soundtrack. A tinny mixture of generic elevator jazz and pier-end organ music, the game's hatefully catchy melodies will have you either humming along or reaching for the volume control. 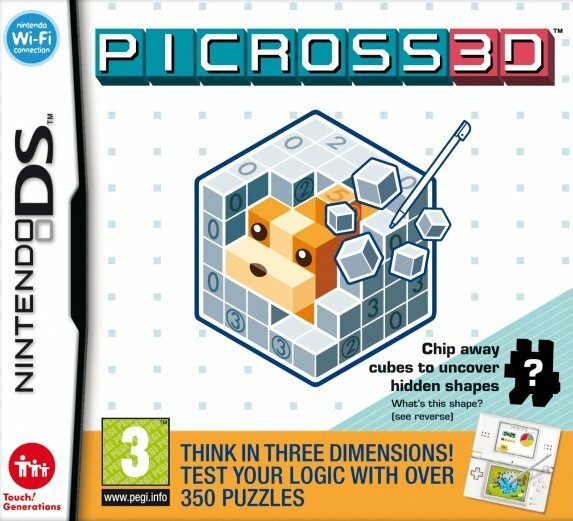 These are niggles rather than game-breaking issues, however, and in terms of challenge and sheer longevity, Picross 3D is hard to fault: there are 350 or so puzzles to solve across three difficulty levels, with yet more to download via Nintendo's Wi-Fi Connection. And if these aren't enough, you can create puzzles of your own, which is surprisingly simple thanks to a stripped down toolbox of blocks, primary colours and labels: you construct your object, click create, and the game constructs the rest of the puzzle for you. 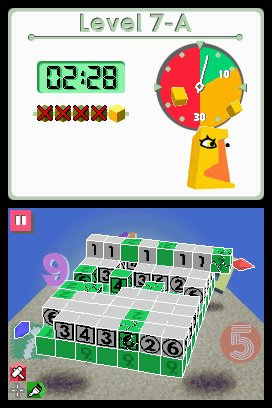 Graphically, Picross 3D doesn't push the DS to its limits, but its pastel-coloured puzzles, which perform little victory animations once completed, are full of charm, and there's a certain pleasure to be derived from gradually filling up your gallery with the eclectic range of objects acquired after beating each puzzle. There's no denying that Picross 3D is a diverting and addictive game, but at the same time it fails to surpass its two-dimensional predecessor. 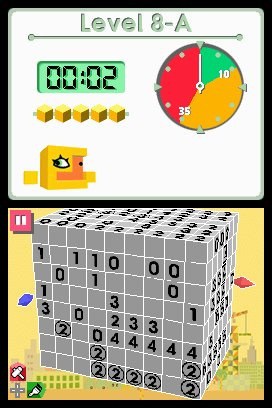 The leap to 3D has certainly added an extra challenge, but it has also made the rules more complicated, and at the same time diluted the purity of Picross DS's comparatively direct logical problems. Nevertheless, the game offers hours of content for those willing to persevere, and for anyone who has already played Picross DS to death, Picross 3D will provide an engaging new challenge. Picross DS stole many many hours of my time and I'll get this one for sure. I love Picross and I'm curious about how the 3D is going to work. Nice review. I may check it out if only because the prospect of creating my own 3D pixellated video game sprite puzzles is a powerful lure. Nice review, I've been looking forward to this! I actually have this game and I think you're being a tad fussy. I treat this game as a new gaming experience which applies the picross rules of play to a 3D infrastructure. There's no real need to directly compare it to picross ds TOO much (though slight comparisons are ineviteable I s'pose). However, I agree its not quite as good as picross ds if you DO comapre them. I'm more inclined to agree with the n-gamer and onm scores of 84% for this game. This is an insta-buy, especially when it hits this states this May at the $20 price point. There are videos online that show just how to play (which I appreciate) and I was a fan of the Mario Picross game way back in the day. I wish they would make THAT game a DSi download game. Hey Ryan, it is great to see you reviewing for NLife, nice one. Picross puzzle games are not really my cup of tea, but I still enjoyed reading your review, particularly the historical links to previous Game Boy and SNES games which were confined to Japan, in your intro. This is not the first genre where the leap to 3D has convoluted the gameplay either, sometimes devs should bite the bullet and stick to 2D. Not that the review, or its score indicate that this is a bad game. A seven is still decent and I haven't played any of these Picross games to really comment, however I just feel that sticking to 2D gameplay is often the perfect fit for some genres, especially if the 3D camera creates issues that were never present from a 2D viewpoint. Cheers. Let me say that this game deserved a 9 and it is the best Picross all around. Picross DS was good, but it had problems when translated to such a small form factor (had to zoom in the puzzle and it didn't fit the whole screen). Picross 3D soves this and gives you puzzles that fit the screen perfectly. Also the camera works perfectly and I have had no problems with the harder/bigger puzzles. You just go, layer by layer and have no need to adjust and dig through small spaces. My 7 year old loves Picross DS, not so much because of the puzzles built-in or the puzzle solving, but because he can make his own puzzles and draw a more detailed picture for it, and then "solve" it by just hitting squares until the shape is revealed. I.e. he loves building the puzzle and drawing the picture associated with it. I suspect this game would be a hit with him as well, as long as you have the option of that kind of "solving", but I take it it's missing the more detailed picture option, so it might not be as much of a hit. I'll pick it up when it goes on clearance for sure, though. 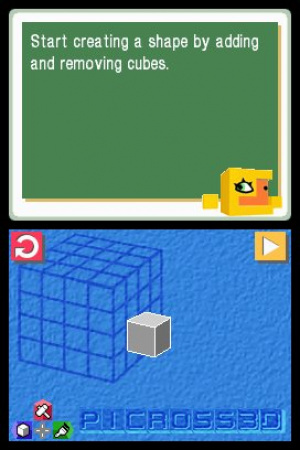 Not convinced by this 3D picross... would prefer a simple Picross 2, with more and more puzzles. I completed Picross DS and almost done with Super Mario's Picross, so looking for my next fix of picross action. I'll have to try some of the non-Nintendo offerings in Japan. Can't wait for this to hit NA. Looks excellent! I've played the Japanese version to death. Its awesome! Time flies when playing this game. 30 minutes feels like 5. The biggest problem with it though, it the time limit for each puzzle get too short at the end of the game. Neverless, still a 9/10 from me.. I own this game too. I played alot when i first got it. I created a few myself but havn't touched it since.. I need to pull this game out again. Thanks for reminding me of this gem. Id give this game a 9/10 as well for those who like sudoku and picross. I second ReInstall and mushroomer. The review did seem a little bit unfair with regards to the gameplay mechanics. I imported the game last year based on recommendations from another NL member. It is really a delightful romp through 3D puzzle land. They game creators pumped so much thought into the animating the blocky shapes. But I agree with both of you; definitely a 9/10 in my book as well. Yeah, this game deserves a 9/10 at least. It's a much better game than Picross DS. I only played the domo. Did I say domo? I meant demo. One question, should I get picross DS first, or picross 3D? Personally, I love this game, but I never really have much time to play it, what with all the other amazing games I've been playing. I tried the demo and really want to get this. I guess Advanced Circuits will have to tie me over until I do. Whoa! Nice avatar Ickaser! Anyway, I now own Picross DS and Picross 3D. 3D is way better! The reveiw is too low! I think this game easily deserves a 9/10, and is bordering on 10/10 territory for me. The control system / camera works great and is a huge improvement over Picross DS, where you constantly had to zoom in and out. The puzzle creator is also quite a bit better. In Picross DS, you'd have to reformat your creations multiples times (the puzzles couldn't be solved), but I've had no such problems so far in Picross 3D. It's also a lot more interesting to see your creations come to life in 3D. The only negative to the game is the music. 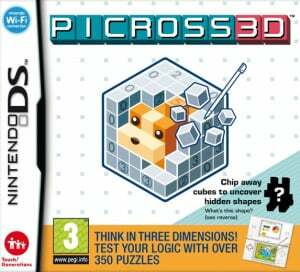 Picross 3D is one of my favourite DS games and is one of the most addicting puzzle games I've ever played. And at only $20 it's a bargain. Eeeeew... Maths Class lol but this game does look pretty cool. ;D might get this. It's so much better than a 7. I love how all the finished puzzles fit into collecions. I agree, 28greg. This game deserves a 10! With the ability to create your own puzzles and download new ones over wifi and share with others, there is countless replay value here (as well as improving your previous scores/times on previously completed puzzles.) This score is way off. Go pick this up for $20 at Gamestop today! Quite possibly the best puzzle game ever invented!!! For the doubters, there's no guessing involved here. The rules of Picross 3D always let you logically deduce every step to the puzzle, so even if you feel you are stuck and have to guess, it's your fault because this isn't possible if you found every clue. The total number of puzzles you get and the fun animations (not to mention the inclusion of a random mode where you have a lot of control over the difficulty level), it's such a generous package for a cheap price.